My issue is similar to other threads I have seen here. I am a on a grandfathered Simple Choice NA plan with 10 GB of high speed data. I am not close to using all of my data. My data speeds are always around 10 Mbps (or higher) download and 8 Mbps upload directly on my phone. 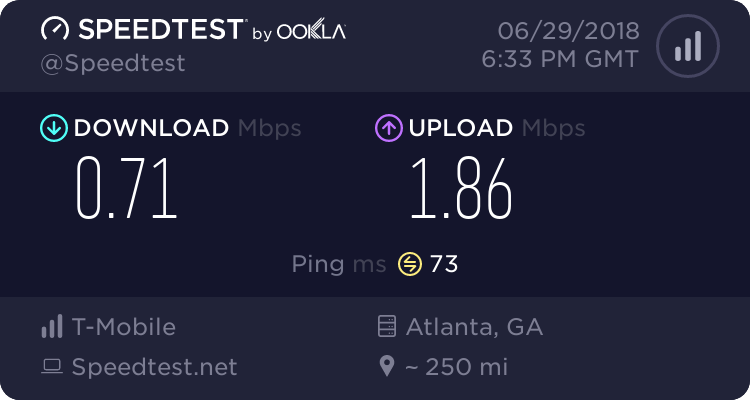 (On the SpeedTest I just ran I got 25.5 download and 8.11 upload.) However, when I USB tether to my laptop (or desktop), data speeds drop to about 0.3 Mbps download and 0.1 Mbps upload. Can anyone from T-Mobile solve this for me? Latest reply on Apr 1, 2019 1:09 PM by d.t. Re: Why is my tethering speed so slow? Yikes, d.t.. Any issue that persists over the course of a year and a half is one that's lasted about one year, five months, and three weeks too long. Assisting with SMHS or tethering issues over our forum is a little tough, because we don't have a secure platform for account access to review the particulars. It sounds like you've reached out for assistance a ton of times (which again, shouldn't be necessary!). In this situation, my best recommendation would be to reach out to our T-Force team via DM on Twitter or Message on Facebook. You've taken such effort to articulate the issue (very well!) -- you can copy and paste what you've posted here! What we need to do now is take a look at the previous tickets filed and re-open and/or escalate them since the issue still isn't resolved. Regarding the follow-up, I sincerely apologize. Since we don't know exactly how long engineering will take to review each individual ticket, when we file one we should be scheduling a set time and date to follow back up with you. If at the time of that appointment the ticket still hasn't been returned, we should set another follow-up appointment. At no time should you be left wondering when you'll hear from us -- that is not our customer service standard! Another good benefit of interacting with T-Force is that you can return to the same message thread to check in on your ticket status with any T-Force rep at any point -- so that will hopefully ease some of the issue there. Question 1. Do you have these issues anytime you tether or only at specific times? Answer: I have been having this issue for about the last one and a half years. Prior to 1.5 years ago, tethering speeds were fantastic on T-Mobile. During the last one and a half years, every time I have tried USB tethering, I have had very slow download speeds (such as a fraction of 1 Mbps). Question 2. have you ever tethered to another device other than your laptop and run into the same issue? Answer: See my original post. I have had consistently terrible download speeds on USB tethering with all my T-Mobile lines, on many different laptops, and several different phones. Question 3. how may bars you have on your phone when you try and connect? Answer: I have 4 or 5 bars at this location -- usually 5. 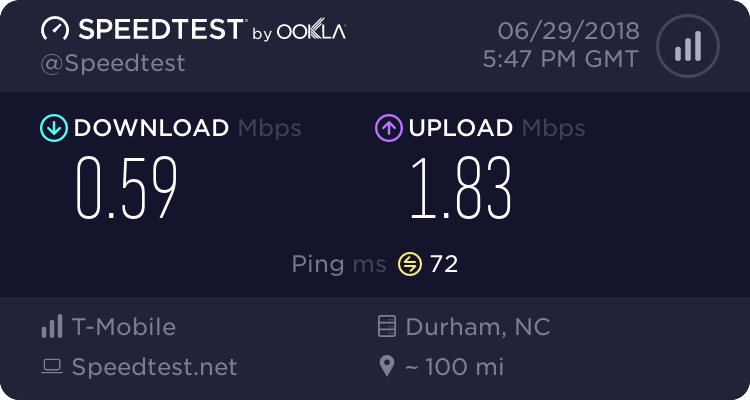 However, I also ruled out a bad mobile network data connection by the following observation: my data speeds are always around 10 Mbps (or higher) download and 8 Mbps upload directly on my phone. (On the SpeedTest I just ran on the phone I got 25.5 download and 8.11 upload.) However, when I USB tether to my laptop (or desktop), data speeds drop to about 0.3 Mbps download and 0.1 Mbps upload. This happens with no change in the position or location of the phone and no change in bars. Question 4. Have you put your sim in another phone to see if the issue still happens? Answer: During the time I have been having this problem I have used multiple T-Mobile branded phones including an LG G5, Galaxy S8 and Galaxy S8+. I received new SIM cards with the Galaxy phones and these new phones with new SIM cards did not improve or change the slow USB tethering speeds. Question 5. Have you tried connecting through your WIFI or do you always do it with a USB cord? Answer: Here are some speed test results I just completed. I ran these tests over the last hour using two different laptops. I tested both USB tethering and WiFi tethering. As you can see 100% of the USB tethering tests have unacceptably slow download speeds. The WiFi tethered speeds are also typically just as slow, but in these tests I occasionally see results that show acceptable speeds. 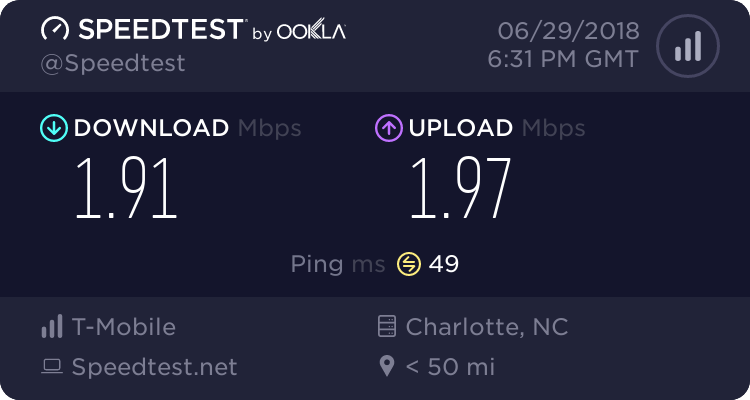 A week ago I was getting good speeds with WiFi tethering for about 10 minutes straight, and then they suddenly dropped to a fraction of 1 Mbps and stay at this crawl the rest of the day. To be clear, all these speed tests were done with my T-Mobile branded Galaxy S8. I used two different laptops and I tested by USB tethering and WiFi tethering. I used different servers during the tests to eliminate the possibility that any one server was slow. The above results are essentially the same as the results I have been seeing for the last year. USB tethering speeds are always slow. WiFi tethering can sometimes be better, but they are mostly very slow too. I just ran another speed test using WiFi tethering. 0.34 Mbps download and the upload test timed out (so that's a 0 upload speed). Sad. This site provides some good data. Soooo, we definitely need to have another ticket filed. And I am sure that's absolutely not want you want to hear since you have not found resolution in them in the past, buuuut. The resolution for this lies 100% in a trouble ticket of some sort. What I would suggest is reaching out to T-Force and linking to this thread so they access to both your account, and the information you have posted here. We aren't able to access accounts through here which is why we are limited to what we can offer, but they have online access to your account unlike us, and they will also have access to all the information you have here! There will also be written record of all the interactions you have so there is a solid paper trail of what has been promised. You can find T-Force through FB or Twitter, there are links in my signature! I reached out to T-Force on June 20th. A ticket was opened. I provided them with even more information than I provided here. Unfortunately, it has been a waste of time. Nobody even asked me any good questions. All I did was continually repeat what I already said here in the first post. T-Mobile has a really bad policy that nobody can speak directly to a support engineer. I cannot speak directly to a support engineer and apparently neither can T-Force. They can open tickets, but nobody can have a conversation with a support engineer. In my T-Force conversation, people come and go and I am continually asked the same questions over and over with nobody going beyond the basics to actually investigate the details. Nobody ever asked me to run a traceroute or a ping or anything else. On June 24th one person told me a new ticket had been opened on one of my other lines. Then on June 29th another person told me that ticket had never been opened. It's like a broken record that repeats the same thing that has been going on for the last 18 months I have been trying to get this solved. I'm really ready to give up on T-Mobile. Thank you Lauren. I received your private message. I prefer to reply here. Unfortunately, my experience with T-Force was just as unsatisfactory as my prior experiences with telephone support over the last 18 months. It started off well, with a T-Force support rep telling me, "It looks like we have not met our commitment on this for you in the past, but I am determined to get this resolved for you. Not only that, I am very curious myself as to what is causing this! We are getting into my weekend, but I would like to go ahead and set a follow up for Sunday evening when I am back in the office it that is okay." Unfortunately, that rep simply dropped out of sight after a few days without seeing it through to any kind of resolution. I then had to start the conversation over with new people which meant answering the same basic questions I have answered dozens of times over the last 18 months. After doing this for several new people in that same conversation, I realized I was, once again, wasting my time. Around that time forum member landonloco posted his solution of using a 3rd party tethering app. I tried that and it does indeed work for me too. After running hundreds of tests on my own over the last 18 months, this recent experiment with a 3rd party tethering app makes it clear that T-Mobile's data management policies are the problem. Therefore, I'm dropping out of the official support channel and I'll address this on my own the way the other person did. Clearly T-Mobile does not intend to fix this because tethering is severely deprioritized by intentional policy. There is a level of dishonestly here. I have been consistently told by T-Force support reps (and phone support reps) that I should expect better tethering speeds. However, somebody should have told me 18 months ago that T-Mobile's network management policies lead directly to unusable tethering in situations as described by landonloco in this thread. I want to add that not only have I been a T-Mobile customer for more than 6 years straight, I have been a vocal promoter of T-Mobile to all my friends and followers. But I am extremely disappointed in T-Mobile's position on tethering. I realize economic factors are driving this, but the policy-makers are being short-sighted in a way that is decidedly not "Un-carrier"-like. T-Mobile is as bad or worse than every other carrier when it comes to tethering and mobile data. (Example: your MiFi device is consistently reviewed as much worse than AT&T's or Verizon's.) Those two features are the two most important for me and, I would guess, for most thought leaders in the mobile space. T-Mobile needs to wake up to this problem and fix it in a hurry. I responded to you in PM as well, but I definitely understand your hesitancy to want to reach back out to them. I still went ahead and made sure I passed this thread along to them for feedback, your experience is certainly not what we have come to expect from T-Force or any of our representatives. I'm unfortunately at a bit of a disadvantage since I'm unable to collect secure account info through a public forum and thus unable to review what's transpired and any notes. I can't entirely speak to your whole situation without all the pieces, but it certainly does sound like there is something going on. If I wind up with more information or able to find anything, I will certainly return to this post and publish any findings. I just switched to TMo on Tuesday (two days ago) after 10 years with ATT. I was ok with the tethering speed being only 3g, but I am getting exactly the same numbers that you are getting. With my TMo branded S8, I am getting anywhere between 7 and 25 Mbps download, but while tethering my Surface Pro 3 through this phone, I am getting between .22 and .52 Mbps! Good grief, that is really bad. Not sure I can do this. I know I don't want to go back to ATT and I won't go to Verizon, so I am really over a barrel. 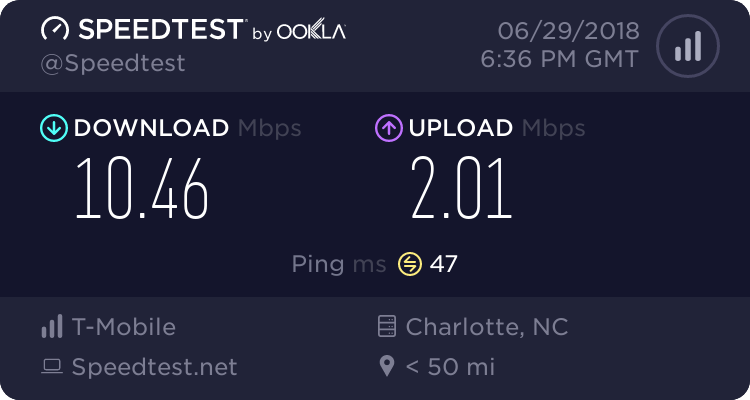 Interesting that your speeds show the same pattern as mine. I think @landonloco has the right idea in his post of Jun 29, 2018 1:42 PM in this thread. I was thinking I would need to add the extra "high-speed" tethering for my line (One Plus plan? ), but apparently that doesn't make a bit of difference, if I am reading your issue correctly. timmyb from what I have read, adding the extra "high-speed" tethering has worked for some people but others still have these super slow tethering speeds even with that paid feature. Even on plans that support "high-speed" tethering, that traffic is severely deprioritized. I think my slow tethering speeds result from an overall network management policy that is independent of one's plan. But if your plan doesn't support high speed tethering, then that's a different issue. If I were you, I would probably try adding the extra "high-speed" tethering feature first and see what happens. Personally, I would not have minded paying T-Mobile an extra amount of money if they could provide good tethering service at a fair price. Sounds like a good plan to try adding it first. I'm going to wait until after this holiday weekend as I'm sure the lines are a bit taxed by the tourists in this town. Not enough to create this much of a slowdown but I want to remove that variable. DT can you add an APN in your connection settings? Because after weeks of internet searches I found a solution for my galaxy s8+. does this form have pm? Yes, add me to your connections, then you can send me a message through this forum. Looking forward to hearing about your solution. It says you have to be following me and excep my following invite to send messages. phamos1 I'd be very interested to try your solution. I've sent the follow request. Thanks. Thank you. I"m going to try the same. I hope my "after" results are as good as yours. After my initial frustration, I decided to bump up the plan to the paid option. It worked instantly. Kind of disappointing that I need to pay for it, but at least I'm not banging my head against the wall trying to figure it out. I am usually only in my "summer home" (which has very poor WiFi availability) for about three months, so at least I don't have to pay for this year round. I have to disagree. What's really frustrating, and what this thread is about, is those of us who are paying for the best tethering T-Mobile offers and are not getting it. 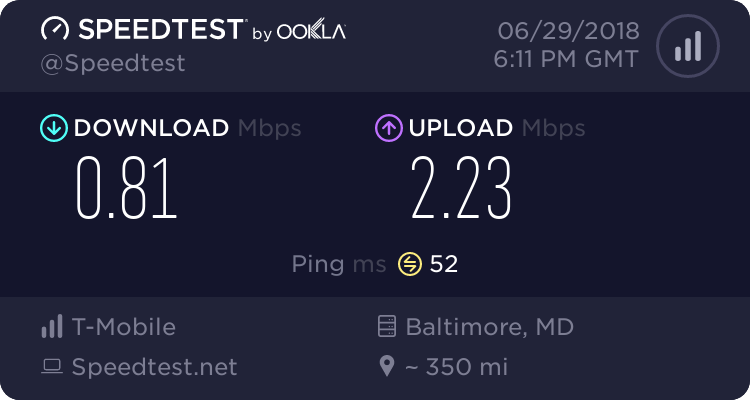 Anyway, I am happy that tethering is working well for some people, but I am just taking exception with that we should call frustrating. As I said, the real frustration is when you pay for it and you still don't get it. I think what makes it particularly difficult is, there is no set standard for what the terms "3G", "High-Speed", etc., mean. I guess I'm just resigned to the fact that "unlimited 3G mobile hotspot" is (unfortunately) really slow. I'm hoping that the competition of the other big 2 will force them to upgrade that in the coming year. Either way, I hope that your long ordeal reaches some kind of successful resolution, and soon! Now, at the store, the employee went into the back and came out with an LG-V30. I had my Samsung Galaxy S8 with me. We did multiple speed tests of USB tethering with their V-30 and my S8 right there in the store. The results were the same as what I have written here. Both phones showed really good speeds when not tethered. Both phones slowed to a crawl (i.e., 0.2 Mbps up and down speeds) when tethered. I took pictures of the store employee, their phone and the speed test results to prove to T-Force that this problem is not limited to something being wrong with my phone. Whatever is causing this has nothing to do with my lines or my phones or anything else related specifically to me. I would LOVE to hear what they have to say now, given this new evidence. I also have been experiencing a baffling issue with tethering speeds for months now. Being on the unlimited ONE plan, with regular download speeds of 50mbps or more, I get a maximum of about 0.6mbps up and down when tethering. My roommate on my same plan as me with the same phone and options gets 60mbps down and 30mbps or better on tethered devices in the same exact locations around the house and area. My local store even swapped SIM cards for me and did a warranty exchange on my phone, as they were confounded as well, and the issue still persists. I also have run multiple tests after doing a factory reset on both my old and new phones, which is incredibly inconvenient, just to rule out software/app interference. The only thing I can possibly think of at this point is there must be something screwed up with my plan configuration. Is there anyone at T-Mobile who can solve this? I don't know what else to do at this point on my end - I've tried literally everything. Please keep us updated. I would love to know what you find out. I still do not have a solution. I had the same issue of POOR tethering speeds right from the git-go...I've been a T-Mobile customer for 6 years. T-mobile throttles back the unlimited ONE plan and really is NOT unlimited. They have lied to us. It is definitely NOT unlimited. They finally told me the 4G speeds have caps for tethering. The initial ONE plan ($15/month extra then unlimited regular data/phone/text is currently a 20 GB cap. They also offer a International ONE upgrade to that ($25/month extra), but that is only good to 50 GB. Once those levels are reached the tethering is immediately throttled back. You then have to wait until your next billing cycle. It took me 3 weeks and about 6 to 7 phone calls to finally find someone that had answers. I feel like it's false advertising or pretty dang close to that. I am having this same issue. I have the best plan option available and yet when I tether I get .35 mb per second. Has anyone come up with at least a work around instead of expecting t-mobile to do something because it seems obvious they don't want to fix it. they clearly just don't care. I still do not have a solution. I'm new to T-Mobile and im going through the same trouble with slowtethering speeds. I have the One plan but it seems that the speed is way below normal. I'm trying to download an app of 5gb amd the download time is over 25 hours! I don't know if upgrading to One Plus will make a difference. I recently changed to the 55+ plan. I have an iPhone x, and my LTE download speed on the phone is 155mbs. 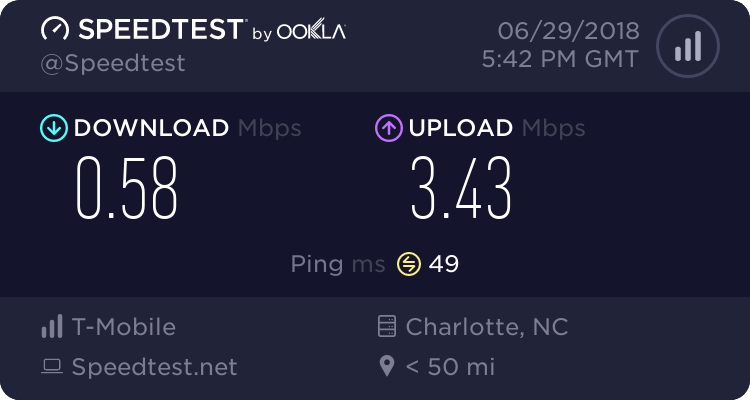 I just tested my tethering speed connected to my MacBook, and the download speed is 482Kbs. What happened? They used to be roughly the same. Am I being throttled for being old? Another annoyed and upset user here with crappy tethering speeds. I am paying for the tethering option on one of my lines. But I have been throttled I get full 3g outside of throttling but when I run from the computer 1mbps download and 0.38mpbs upload. Several support calls and tickets later NO HELP AT ALL!!!! I get the same questions, give the same answers and just get more annoyed with the fact that this company cannot get tethering to work. What I need is very simple. 3. Someone who is there when I call not hours later. Look I'm willing to pay but if the service is not there it's time to cancel. I have explained that to reps and still get nothing. I've noticed the same issue since March of this year when I fist got my t-mobile sim. It's a business plan so it's supposed to be unlimited . I'm glad this has been covered extensively on this thread. I see a post suggesting APN but has anyone had luck with it ? The T‑Mobile ONE and T‑Mobile Essentials plans include tethering at a maximum of 600 kbps. Customers on these plans may choose to activate an add-on feature for a set amount of tethering data at up to 4G. After learning this, I opted to add the 4G tethering to my plan. $15 a month for 20GB HotSpot data. I now get 20 Mbps, or better. Even with the additional $15 a month, I'm still paying $90 a month less than I did with AT&T, so . It appears TM doesn't want it's customers tethering and using a lot of bandwidth so they act like there is no solution. We can fix this problem. We should all boycot tmobile and leave until they change their methods and stop giving us the runaround with useless troubleshooting and wasting our time. They are obviously sandbagging because they dont want us to use it. Im on the lookout for another solution. Tmobile has been good for me for years but now they arent giving me what I pay for. I still don't have a solution to this issue or any other support issue I have opened with T-Mobile. My phone bill is over $200/mo and I can't even use tethering, DIGITS doesn't work properly and support won't ever follow up with me like they promise. This issue is still a problem for me, T-Mobile. One of the trouble shooting steps I did about six months ago when I was in a T-Mobile store seeking help on this issue was to purchase a tablet and a new line of service. The specific reason for purchasing the tablet and line of service was for tethering. As a trouble-shooting step, this would allow us rule out the possibility that the tethering issues I have been facing were related to my devices. So I bought a new device with a new line of service. I have been trying to get adequate tethering speeds on that new device since I purchased it six months ago. No such luck. My tethering speeds remain about 0.3 Mbps download and 0.1 Mbps upload on average. So today I canceled that line of service. I still have nine other lines with T-Mobile, but if you don't offer me a workable tethering solution, I will take all 9 of those lines to another carrier.